Business owners are in a constant struggle to distinguish themselves from all of the other businesses out there. Especially in the virtual world, this can be a serious challenge. How can you make your website, and therefore your business, stand apart from the crowd? One item that can really boost your customers’ view of you is accreditation. Accreditation is a tool used to gain respect and credibility. Businesses who have sought out accreditation are telling the world that they are good enough to earn this certificate. There are a variety of accreditation’s available to businesses and you have undoubtedly heard of businesses being ‘Eco-Certified’ or ‘ISO Accredited’. 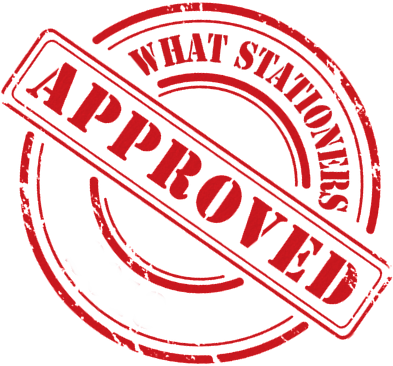 For an office supplies business there is now our What Stationers Seal of Approval. Accreditation’s can also be selling tools and can help you meet new people and increase your sales. As a professional and accredited blogger with over 2000 articles under my belt, I have seen how accreditation’s can help get your voice heard. My site is an authority on all things related to office supplies, and now I’m giving you the chance to benefit from my authority status. By earning the What Stationers Seal of Approval, you will be provided a badge that you can display on your website and printed stationery. This will show everyone that you are accredited and work with us. You will also receive a business description and a link to your website on our approved supplier directory. The badge is a circle with the words ‘What Stationers Approved’ and can be embedded on to your website. While the badge itself is a wonderful addition to your website, the fact that you will be listed in our directory can really help your business grow. What Stationers is the go-to site for office suppliers and those purchasing supplies. Now, all of the best suppliers will be listed on one easy to browse directory. Having your name and description on this list will increase the number of customers who click over to your site. We don’t charge you any accreditation fees to use this badge. You simply have to meet the qualifications we have designated in order to be accredited. Deal with enquiries we receive through phone, email or from the contact us page. As part of your accreditation, we will be promoting your business on the social media sites that we are already active in, but we would like you to be there with us. You don’t need to have accounts with all social media outlets but we feel that social media is an important part of the business world today. If we have already worked with you in the past or feel that you would be worthy of our badge, we may issue an invitation to apply for accreditation. Otherwise, feel free to feel contact us and we will work to get you accredited as soon as we can. Since the badge designates the year you are approved, it is a great way to build credibility throughout time. For instance, in five years time if you have been accredited for five years, you can proudly share this news on your site. Now is the time to take the next step in your business. Work on getting your What Stationers Seal of Approval badge and your business will be duly admired by those you work with.